Master Kitamura explained that he employs the thick-shell raden technique that he learned from classical works such as the Nara period items contained in Todaiji’s treasure house. He went on to say that in Japan replications of important cultural objects were produced to exhibit substitutes for the public and to allow people to study and hand down the classical techniques. He discussed the urushi-painted wood sheet he had used for the lid of a replica of “Akinoshika-Makie Tebako,” a national treasure made in the 13th century during the Kamakura period. Dr. Nguyen examined the lacquer situation in Binh Duong, a province north of HCMC. He indicated that it was becoming industrial, but still had three traditional professions: pottery, woodcarving, and lacquer. He noted that the lacquer craftsmen were still active in the Tuong Binh Hiep village. He explained that after nearly 300 years, the lacquer vocation at Binh Duong Province still expressed the identity of the local culture. 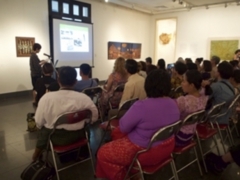 Dr. Nguyen’s lecture focused on the techniques of traditional lacquer at Bin Dong, which included sơn lộng, vẽ chìm, vẽ phủ mài, ream technique, emboss technique, inlay sea shell and inlay egg shell, and other complex techniques. 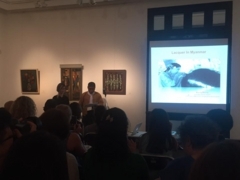 U Maung Maung discussed lacquer’s long history in Myanmar and its tradition as part of Myanmar culture. Lacquer, he remarked, was first used to make simple bowls and plates from woven bamboo, but over time became a highly developed craft and art form. 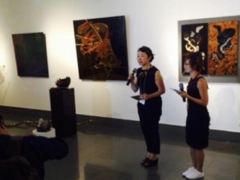 In his talk he expounded not only on the history but also on the beauty and uniqueness of lacquer as a material. and He discribed the process of how lacquerware was made, traditional and modern designs, and shared his thoughts on the challenges now facing the industry. 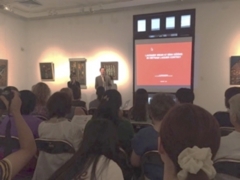 This lecture was an overview of the science and the technology of Urushi, Asian Lacquer. 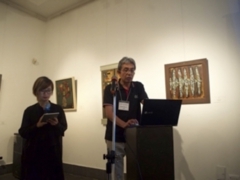 In particular, Dr. Oyabu explained how Urushi sap was collected, its main components, and the composition of Urushi from various countries in Asia. He discussed the refining process in Japan, and the postive and negative characteristics of Urushi as a coating material. These explanations were from a scientific standpoint. Ms. Ando made clear that while lacquer arts were commonly categorized as a “craft” or “arts and crafts”, in Vietnam, Son Mai, or lacquer painting, was an established genre of pictorial art. She went on to say that Son Mai was now recognized internationally. She asserted that the secrets behind the flourishing new art form lie within the very nature of Son Ta, Vietnamese natural lacquer, itself. The advantages of Son Ta become clearer when studied in comparison with other kinds of natural lacquer. 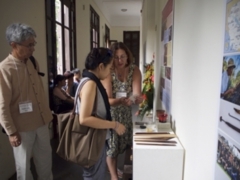 The poster session focused on current state of Asian lacquer. Topics included lacquer art and technique, lacquer tree cultivation, the scientific study of lacquer, and natural lacquer advocacy and promotion. There were nine posters. The posters were in English and Vietnamese. The group’s poster reported on a study of a Tebako-Box that was a 20th century Japanese product in 16-17th century style with East Asia gold painting and iconography. The Box had been damaged with cracks on cover section caused by age. It was conserved by Japanese traditional urushi-lacquer techniques at Tsurumi University in 2015-16. X-ray CT Scan and the other scientific analysis were used. 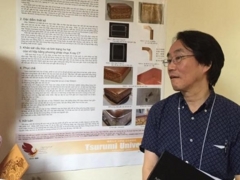 The poster described how the Institute developed a new method of processing Urushi with three-roll mills by focusing in the dispersion of water contained in it. The characteristics of this processed urushi are high glossiness and transparency, low viscosity, faster drying with improved weather resistance and physical properties. Therefore, the improved urushi was able to be used as an outdoor, all weather coating material for shrines, temples, building exteriors, and vehicles. Ms. Ross’s poster focused on Wajima Lacquerware and the unique techinques used. That over its 600-year history Wajima Lacquerware was known for its beauty and durability. The poster described the process of making this unique craft. It concluded by noting that in 1977 Wajima-nuri was designated as an important intangible cultural asset by the Japanese government. This poster illustrated some of the art classifications that influenced both the production and reception of Vietnamese lacquer painting. Ms. Thomson argued that Vietnamese lacquer painting was a unique art form that used Son Ta an indigenous material to produce expressive, 'Fine Art' paintings. Her research attempted to position Vietnamese lacquer painting within existing art historical discourses, which were continually shifting. The NGO was founded by urushi artists who wanted to support and preserve the production of domestic urushi sap in Japan. 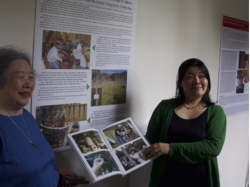 During almost 20 years of challenges, using their enthusiasm and a wide range of ideas, the members contributed to preserving and promoting traditional techniques of collecting the sap and to raising awareness of the amazing properties of this natural material. 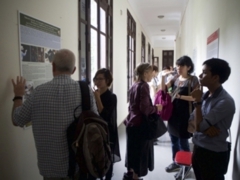 Eric Stocker’s poster recounted the chain of events that led to the revival of lacquer industry and culture in Cambodia. Historically, Cambodia had a thriving lacquer industry and culture. But this was lost in the upheavals of recent times. Recently lacquer trees began being tapped again and lacquerware using natural vegetal lacquer is again being made. The Angkor Artwork atelier is unique in Cambodia because it the only workshop where natural Cambodian vegetal lacquer is used. About ten examples of sutra boxes from the Goryeo Dynasty are known to exist. The poster detailed Ms. Lee Seon-joo’s research on the dating of particular sutra boxes by comparing the patterns of box decoration chronology. One box had a chrysanthemum arabesque pattern; the other had a peony arabesque pattern. By comparing the boxes with other artifacts, Ms. Lee Seon-jooto concluded that the pomegranate arabesque pattern sutra box predated the chrysanthemum arabesque pattern sutra box. Mr. Dillon’s poster called upon Asian lacquer communites to promote natural lacquer by working toward the trademarking and branding of products using natural lacquer. He argued that lacquer was a cultural heritage shared by East Asian peoples and should be officially recognized as an Asian and a World Heritage. He noted that natural lacquer was under threat because modern science had created many chemical varnishes and that, unfortunately, some businesses profited from selling crafts and artwork painted with these varnishes as higher valued “natural lacquer” products. 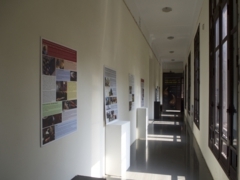 The poster concluded that international lacquer community needed to educate the public and governments to natural lacquer’s uniqueness, cultural importance, and beauty. This poster gave an overview of the history lacquerware production, decline, and reemergence in Laos. 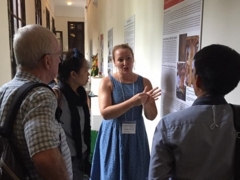 Ms. Brown described how in northern Laos, the Shan ethnic group, who also lived in Myanmar, China, and Thailand, had been the predominant lacquer artisans. Conflicts in Laos eventually led to the migration of the Lao Shan, and the loss of lacquer production and skills. Therefore, until recently, lacquer production was limited to a few artisans using lacquer sourced from Myanmar and Vietnam. In 2014, the return of a religious and cultural relic to Luang Prabang led to renewed interest in lacquer, increasing the demand for lacquerware and skilled artisans. 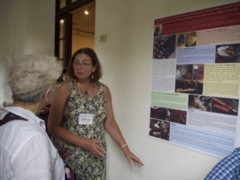 The poster concluded with the hope that with new lacquerware producers in Luang Prabang the desire for Lao lacquer products might grow, reviving this tradition.